If you had to put money on what type of app Google would release next, you probably wouldn't have wagered much on this. 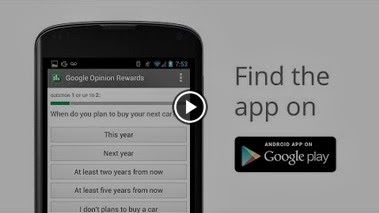 Forget searching, maps, and cloud storage, Google Opinion Rewards is an app that you can use to earn credit that can be spent at Google Play. Sounds good? Well, you have to be willing to do a little work. What's the catch? The clue's in the name of the app: you'll have to spend time completing surveys. The free Android app is available in the US only (for the moment, at least) and once you have created a basic profile you will be notified whenever a new survey is ready to be completed. Unlike other paid surveys, it looks as though there is going to be a limit on how many are announced. The frequency is described as being "about once a week". Questions will range from, "Which logo is best?" and "Which promotion is most compelling?" to "When do you plan on traveling next?" It's fairly safe to assume that there will also be surveys that are rather more involved and include more than just a single question -- although they are referred to as being quick and easy. What do you make of it? Is it a nice, simple way to gain credits that can be used to buy apps, books, movies and music? Or is it just another way for Google to harvest data about its users? And if you fall into the latter camp, is the prospect of a free app from time to time enough to allow you to put this to the back of your mind?